FOR IMMEDIATE RELEASE: Lewiston, Maine (December 17, 2015) – New England Fights (NEF), America’s number-one regional fight promotion, will hold its next event, “NEF 21: THE IMMORTALS” on Saturday, February 6, 2016 at the Androscoggin Bank Colisée in Lewiston, Maine. The fight card is scheduled to feature both mixed-martial-arts (MMA) and professional boxing bouts. Earlier today, NEF announced the addition of a professional flyweight bout to the “NEF 21” fight card. “Sleepy” Norman Fox (0-0) will make his pro debut against Brandon Warne (0-1) at a fight weight of 125-pounds. Fox put together an impressive 4-2 record as an amateur, starting his career in the NEF cage in the summer of 2013. He won his first four in the NEF cage, all via stoppage prior to losing his bid to become NEF MMA Amateur Flyweight Champion to Dustin Veinott (4-4) last June. 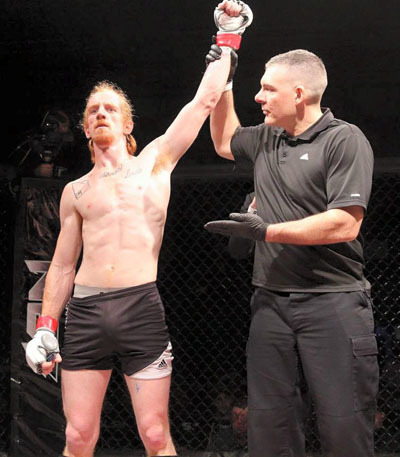 The back-and-forth battle with Veinott ended in a split decision, and it has been nominated for “2015 NEF Fight of the Year.” Later in 2015, Fox and teammate Jason Lachance (2-3) purchased the MMA Athletix gym in Bath, Maine from their former coach, Ryan Cowette (2-3). The upcoming bout with Warne will be the first of a multi-fight developmental deal Fox signed recently with NEF. Brandon Warne is a member of Team Bombsquad based out of Ithaca, New York. He excelled in the amateur ranks of the sport, amassing a record of 5-1 with three finishes. Warne made his professional MMA debut this past October in Rhode Island in a losing effort to David Baxter (2-0). He comes to Maine looking for his first win as a pro against Fox.